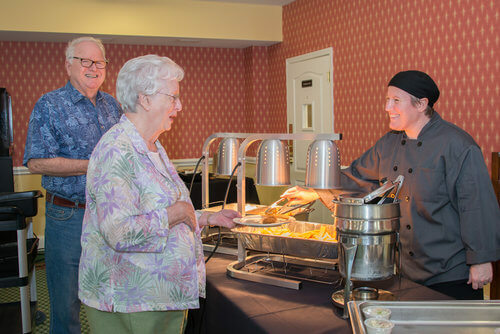 The Dorchester offers a variety of floor plans for seniors 55 years of age and older ranging from $835 to $1600 per month. There are no up-front or monthly maintenance fees and utilities are included. We offer one and two bedroom units, all of which are single level with plenty of storage and fully equipped kitchens. Many are W/D equipped and a select few overlook our courtyard. Every apartment has access to the monthly activities program, the dining room and more! The Dorchester is a community that focuses on residents' well-being above all else. As such, our community offers a list of services available to residents should they need a little extra help from time to time. We offer in-home doctors visits, on-site physical therapy, friendly faces to run errands, housekeeping and much more! The best part? You only pay for the services you use! Don't call us a retirement community. Why? Because to retire means "to withdraw or seek seclusion." At The Dorchester, our residents enjoy a vibrant campus filled with amenity rooms and a hearty activities calendar offering up daily opportunities to do what they love, try something new or teach what they've mastered... all they have to do is open their front door! "Since moving to The Dorchester I have met a lot of friendly people. The camaraderie is fantastic. There are plenty of activities to help me keep living the active life I am used to so that I am never bored!"